1 of 2 Heat grill or grill pan to medium-high. Grill peaches 4 minutes per side, until charred and slightly softened. 2 of 2 Whip ricotta and 2 tbsp of the honey with a hand mixer until well combined. 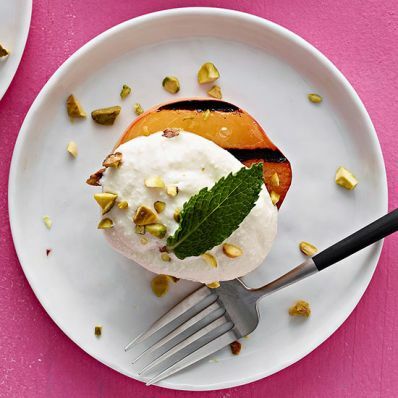 Spoon evenly over peaches, then sprinkle with pistachios and drizzle with remaining 2 tbsp. honey. Garnish with mint leaves. Serve warm. Per Serving: 4 g sat. fat, 19 g carb., 8 g Fat, total, 21 mg chol., 36 mg sodium, 1 g fiber, 6 g pro., 164 kcal cal.